It was only an hour or so after the news that the Mets had swapped for Alex Torres that it was announced they’d traded Matt den Dekker to Washington for a true lefty specialist, Jerry Blevins. This appeared to put the Torres acquisition in perspective as a more general bullpen depth addition which given the shaky health of Bobby Parnell and Vic Black — not to mention the performance of Jennry Mejia over the last six months (you could look it up, but don’t) — seemed to make sense. Despite it reminding me more of Billy Wagner than I want to be reminded, Blevins can step right into the No. 13 jersey which has been unissued since Josh Satin took it off a year ago. Just as significantly, the trade reopens No. 6, to which den Dekker brought relative stability, having held it down since July of 2013. I wouldn’t be at all surprised to see No. 6 next on the back of Daniel Muno, the presumptive middle infielder if Daniel Murphy can’t make the squad. From a baseball point of view I liked den Dekker but it was obvious his opportunity to be significant in New York was receding as Juan Lagares’s star was rising and other than the luxury of a decent reserve in AAA, he’s better off getting a chance to play. As for Blevins, the numbers suggest he’s a terrific lefty-killer and will be called to demonstrate as much vs. Bryce Harper and Freddy Freeman. His arrival makes me wonder how the Nats will manage to retire Granderson or Duda when they need to. 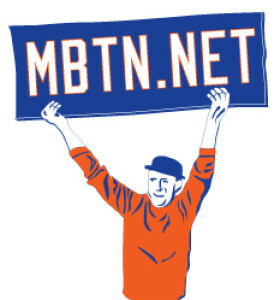 The Mets just aquired Blevins from the Nats for den dekker.